"Take the shot, O'Brien, now! You're the only one who can do it!" — Cal ordering O'Brien to kill the Prophet. Cal-141 was a Spartan-II supersoldier of the UNSC Naval Special Warfare Command. Cal-141 was abducted and conscripted into the SPARTAN-II program by Dr. Catherine Halsey in 2517 when she was just six years old. Cal was then taken to the planet Reach and was trained by the AI Déjà and Chief Petty Officer Mendez, along with the rest of the Spartan children. Between 2540 and 2551, Cal-141 was sent on an operation, along with the four Orbital Drop Shock Troopers she commanded, to assassinate a Minor Prophet and gather intel of unknown ruins on a Covenant-held planet, Heian. The squad consisted of Dutch, O'Brien, Cortez, and Checkman. Only three remained after the drop, as Checkman was killed in the upper atmosphere during the orbital insertion. After landing, she rescued O'Brien from drowning in a swamp. However, the ODST expressed no gratitude and yelled at Cal for having thrown him about. During the operation, Cal fought a Jiralhanae chieftain that nearly killed O'Brien from behind. After gouging out the chieftain's right eye and pushing it over a waterfall, Cal rescued O'Brien from near death. Again, the ODST expressed no gratitude, instead berating the Spartan. While waiting for the Prophet to arrive, the Brute chieftain that Cal had apparently killed the day before ambushed the humans. Cal spotted the Brute as it was about to strike O'Brien and quickly pushed the ODST sniper out of harm's way. She was hit across the head and right shoulder by the chieftain's gravity hammer, resulting in fatal injuries, despite her armor taking the blow. After Dutch killed the Brute, the trio removed Cal's helmet to inspect her injuries. They were stunned that Cal was a female, as opposed to the squad believing she was a male, especially O'Brien and Cortez. Cal, realizing that with her badly damaged arm, as well as her blurring vision due to her head injuries, she would no longer be able to take the shot, ordered O'Brien to kill the Prophet, which he succeeded in doing. 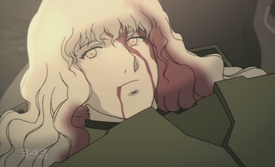 After O'Brien killed the Prophet, the ODSTs tried to tend to Cal's wounds, but she knew that she would not be able to make it back to the destroyer that deployed them to Heian. In her dying words, Cal asked Cortez to make a delivery to Dr. Halsey. This delivery consisted of an optical chip from Cal's helmet, which contained intelligence of the planet the mission was carried out on, as well as ruins that were neither human nor Covenant. Cortez tried to assure her that she would be able to give the chip to Halsey herself, but Cal replied that the two of them knew it was not going to happen as she felt her death already moments away. She held Cortez's hands a bit longer and eventually died before the three ODSTs. Cal's death left a profound impact on the ODSTs with whom she fought on the mission. They, like all ODSTs, had a bitter rivalry with the Spartans and considered them to be freaks, but Cal's efforts in the mission and her actions in saving O'Brien's life many times until the loss of her own had changed their thoughts and opinions on the Spartans. This change was shown well as the ODST team later returned to their ship, where both Cortez and Dutch angrily scolded a soldier, Berger, for mocking Cal's abilities and joking about her death. O'Brien pondered on how he might be dead if it hadn't been for her. Publicly, she was likely classified as missing in action or wounded in action rather than killed in action, as per the Office of Naval Intelligence's policy regarding the deaths of the supposedly-invincible Spartan-II super soldiers. Cal was voiced by Emily Neves. Cal emerges from her SOEIV after landing on Heian. Cal and the surviving ODSTs. Cal wielding an MA5B assault rifle. Cal-141 during the assassination mission on Heian. ↑ 1.0 1.1 Taylor H. Miles, who participated in the mission on Heian, enlisted in 2540, meaning the mission occurred during or after 2540. During the mission, Cal wore the Mark IV MJOLNIR armor, which was replaced by the Mark V in November 2551.